Finch Field is an outsider at school, mocked by the others kids for her crazy dreams. She's excited to be spending summer with her beloved Granny in Sunview-on-Sea but when she arrives she discovers a problem. There's a dark cloud looming over the town and it's stealing the sunshine. The usually happy villagers are miserable. What danger threatens them and how can a girl with pink hair use her special dream, of flying through the air, to save them from a terrible enemy? Finch must first believe in her own dreams before she can save the dreams of others. 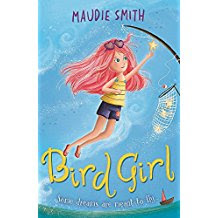 Maudie Smith weaves a wonderful tale of fantasy and friendship in this delicious story of dreams and monsters. It's quirky and clever and magical - exactly my kind of book. It will be loved by fans of Holly Webb and Jacqueline Wilson. Perfect for age 8-12. Thanks, Sharon - and who cannot have hope in the magical properties of pink hair?